As Canada marks its 150th anniversary this year, Vancouver and its stunning environs are leading the globe in eco-minded design and travel-worthy attractions. One can’t help but notice upon first arrival in Vancouver that everyone seems to be on bicycles, in trains, or walking. It’s a welcome sight and one that makes sense, given the city’s mission to become the greenest in the world by 2020. This ethos bleeds into all areas of life and is one of many attractive selling points for the most populous city in British Columbia, the westernmost province of our northern neighbors. It’s home to Canada’s most expansive green roof, a six-acre plot on the Vancouver Convention Centre, full of native plants and grasses. It’s an example of what’s referred to in urban planning circles as “Vancouverism,” which refers to the delicate balance of respect for nature and healthy living with enthusiasm for dynamic urban life. Considering it’s Canada’s 150th (to celebrate, all national parks, national historic sites, and national marine conservations areas are free through December 31), there’s no better time to discover one of its most enthralling areas—breathtaking from a natural-beauty standpoint, and fascinating when it comes to culture, design, and creative output. There’s far more to B.C. than hiking, skiing, and snowboarding (think surfing and wine tasting! ), and truly there’s no reason not to go. 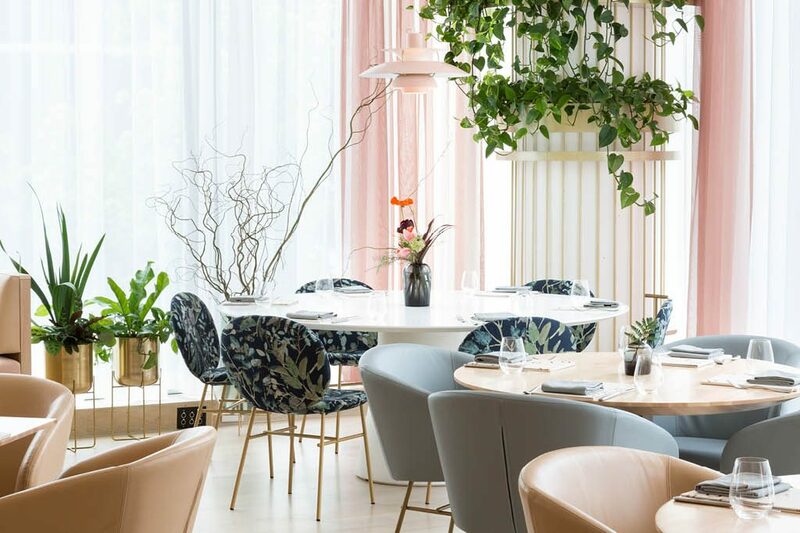 Opened in late spring, Botanist has to be one of the most beautiful restaurants today, decked out in peaches and pastels, and designed by award-winning firm Ste. Marie Design, with some 250 native plants (50 species) of the Northwest, both living and preserved, woven throughout. The restaurant and garden terrace serve fresh, savory, and colorful dishes—as well as a $108-per-person tasting menu option called “We’ll Take It From Here’”—and there’s a newly added champagne lounge overlooking the lobby. Then there’s the cocktail lab, a glassed-off scientific space where an award-winning duo has devised ultracreative concoctions—using such contraptions as a band saw for custom ice and a centrifuge for clarified strawberry juice—served in sculptural drinking vessels, including a glass bird perched in a nest.